The Music Fan Film Series & The Woodstock Film Festival present a screening of the documentary film Sidemen: Long Road to Glory at 7:15 p.m. on Aug. 2 and 3 at the Rosendale Theatre, 408 Main St., Rosendale. Q&A after the film on Tuesday, Aug 2 with Hubert Sumlin’s manager, Toni Ann Mamary. 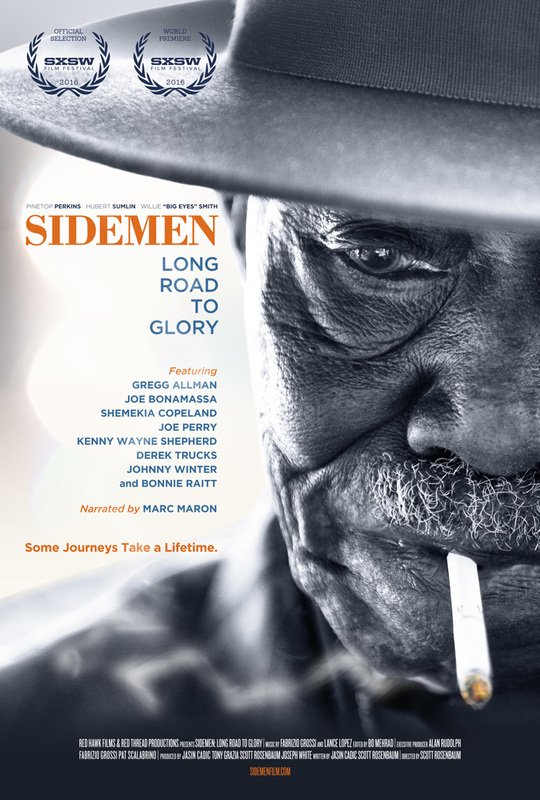 Sidemen: Long Road To Glory is an intimate look at the incredible lives and legacies of piano player Pinetop Perkins, drummer Willie ‘Big Eyes’ Smith and guitarist Hubert Sumlin, all Muddy Waters and Howlin’ Wolf sidemen. The film captures some of the last interviews and their final live performances together, before their deaths in 2011. The historic live shows are accompanied by performances and personal insights from many of the blues and rock stars these legendary sidemen inspired including; Bonnie Raitt, Gregg Allman, Derek Trucks, Shemekia Copeland, Robby Krieger, Kenny Wayne Shepherd, Joe Perry, Joe Bonamassa and Johnny Winter. Directed by Scott D. Rosenbaum, the film honors the life and musical legacy of these aging bluesmen in the spirit of Martin Scorsese's tribute to The Band in The Last Waltz. Rosenbaum and producers Jasin Cadic, Tony Grazia and Joe White followed the musicians on the road for three years, capturing an important moment in the fleeting history of The Perfect Age of Rock'n'Roll Blues Band. Over the next three years they would follow these blues legends, shooting live performances, an historic Grammy win, dozens of intimate interviews, countless behind-the-scenes moments, and documenting their lives on the road. Hubert Sumlin’s manager, Toni Ann Mamary, will be present at Tuesday’s screening to discuss the home side of Hubert's life in Totowa, NJ, offering a behind-the-scenes personal account. Toni Ann’s family gave Hubert a place to live until he died in 2011. She will discuss the importance of The Pinetop Perkins Foundation, which provides encouragement and support for young musicians and provides care and safety for elderly musicians toward the end of their career. For more details, go to the Pinetop Perkins Foundation. The Woodstock Film Festival will present a very special screening of Newtown on August 24 at 8:15 pm, courtesy of Abramorama. The film will be co-presented with Upstate Films at Upstate Films in Rhinebeck. The film will be followed by an in-person Q&A with director Kim A. Snyder and producer Maria Cuomo Cole. Filmed over the course of nearly three years, the filmmakers use unique access and never before heard testimonies to tell a story of the aftermath of the deadliest mass shooting of schoolchildren in American history on December 14, 2012. Newtown documents a traumatized community fractured by grief and driven toward a sense of purpose. Joining the ranks of a growing club to which no one wants to belong, a cast of characters interconnect to weave an intimate story of community resilience. Purchase tickets to what promises to be a powerful and eye-opening night here. On hand for the presentation were four past poster artists including Joy Buran and Noelle Melody (2015), Kathy Ruttenberg (2011), and Karen Whitman (2008). Signed limited edition prints and posters, are available for purchase at THE FILM CENTER at 13 Rock City Road, Woodstock, NY or on the Woodstock Film Festival website. The Woodstock Film Festival brings new energy to its press office with the addition of entertainment writer Deborah Medenbach as press director. "I've had years of experience covering the festival as a journalist, so I bring a unique perspective to bridging the needs of the writers and the filmmakers in the thick of this vibrant event, " Medenbach said. "I'm excited to be part of a forward-thinking team that always celebrates innovation and fierce independence. Each year tops the one before." Medenbach was a staff writer for the Times Herald-Record newspaper for two decades and writes for regional magazines and historical journals. She is a competitive sailor, avid kayaker and hiker. She leads kayak tours for the Thoreau Society in Massachusetts and will direct publicity for the society's 2017 Thoreau Bicentennial next summer. She and her husband Barry have lived on the site of a former summer resort in Kerhonkson since the 1980s. "I've known Deb for years as an outstanding reporter who always covered the Woodstock Film Festival with integrity and interest. I feel very fortunate that we can have her now on our side," said festival co-founder and director Meira Blaustein. "Deb brings not only the deep understanding of what journalists need, but after interviewing countless filmmakers here year after year, she knows exactly how to bring their stories and passion out into the world in the best possible way." Deb Medenbach can be reached at press@woodstockfilmfestival.com or by phone at 845-679-4265. To sign up for press releases and newsletters, fill out our ONLINE PRESS FORM. Many thanks to this year's filmmakers. The 2016 CALL FOR ENTRIES saw a 46% increase in filmmaker submissions. Programming teams continue to view the more than 2,000 independent film submissions from around the world for consideration for the 17th Annual Woodstock Film Festival, taking place Oct. 13-16. "Every continent was well represented," festival Executive Director Meira Blaustein said. "The quality of the films have been outstanding and it is making the selection process very challenging. It's going to be an incredible program." The full schedule will be released in early September. Stay tuned! Whether driving a car, taking tickets, decorating venues, or making sure filmmakers have what they need, VOLUNTEERS are the lifeblood of the festival! Make friends and learn about the film business from the inside out. Volunteers receive a a crew shirt, training and vouchers for films. If you're interested in heading up our volunteer crew, we're looking for an ideal LOCAL candidate. Duties include beings responsible for helping recruit and schedule volunteers with different departments including guest relations, tech, art, admin, press and venues. The applicant needs to have excellent people, phone and computer skills. You must also be organized, focused, proactive, and available to work flexible and longer hours, when needed. Our congratulations go out to our Woodstock Film Festival alumni and friends, making a splash at the Toronto Film Festival this September 8 to 18. The opening night film for TIFF16 is the World Premiere of The Magnificent Seven, starring WFF Advisory Board members Ethan Hawke and Vincent D'Onofrio. A Gala Films offering is Loving, produced by Peter Saraf, a WFF Founding Member and Advisory Board member. The film has created buzz from Cannes to the Academy. The TIFF screening is Loving's North American Premiere. The 2004 Woodstock Film Festival Maverick Award Winner Mira Nair presents the world premiere of her new film Queen of Katwe, starring Lupita Nyong'o and David Oyelowo at Toronto. From there, her film goes on to the London Film Festival in October. Katherine Dieckmann, who screened her film Motherhood at the 2009 Woodstock Film Festival and was a key participant in the Amazing Women in Film panel that year, presents the World Premiere of her new film Strange Weather as a Gala Film offering at Toronto. Director Jonathan Demme has a long history with the Woodstock Film Festival, both as a panelist for the 2009 Music in Film panel and as the 2012 Maverick Award Winner. He brings the World Premiere of JT & The Tennessee Kids to the Toronto Film Festival. Good luck to all our Woodstock Film Festival alumni and friends. We celebrate your successes! Bring your next film to Woodstock. The films above were either produced in the Hudson Valley, shown at the Woodstock Film Festival in years' past, or both. These films are streaming RIGHT NOW on netflix.com. Click on their corresponding picture to check them out! We would like to also extend a thank you to our official 2016 WFF sponsors and three advertisers who joined us for year-round Newsletter support: Sunflower Natural Foods Market, Waterside Getaways, and Woodstock Yoga.